(among tribal peoples) a magician credited with powers of healing, divination, and protection against the magic of others. 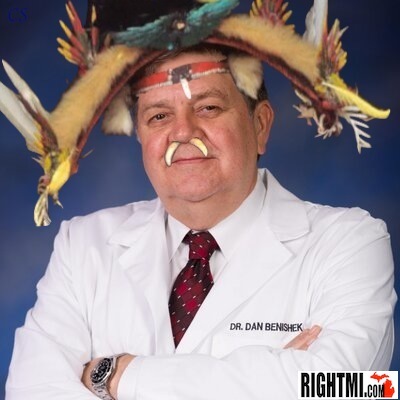 It’s no secret to loyal RightMi.com readers that I have little use for, Rep. Dan “Enough is Enough” Benishek. You see, good ‘ol slow-talking Doctor Dan, has this history of wanting to portray himself as a “Constitutional conservative” only to vote to raise the debt ceiling, reauthorize the NDAA, and vote to fund Obamacare. That’s a “Constitutional conservative”? Hardly, and his 1% margin over Gary McDowell, in 2012, certainly serves to highlight that CD-1 voters see Doctor Dan as a fraud who happened to be in the right place at the right time in 2010, for certain movers and shakers within the state Party’s apparatchik. Well, upon discovery, I just happened across Doctor Dan’s new allegiance to the Progressive Country Club, or as founder Fred Upton, would like to convince us unapologetic Conservatives, his “main street partnership”. Frankly, I do not see one thing considered normal, Constitutional, nor even Conservative about its founders and their Democrat-lite mission statement. It is though, a clear sign of how desperate Dan Benishek is to remain in office. It’s time for Doctor Dan to be booted from the District of Corruption, and back to his private life of billing Medicaid/Medicare.